Summer 2005 in central London. As the city swelters in unusual heat and the Mayor increases the congestion charge, the tube is packed beyond its limits, swelled by tourists and shoppers. A sense of danger is in the air; since the suicide bombings in Egypt and Iraq, the red alert is on for al-Qaeda. So when a young woman falls to her death in front of a rush hour train, panic spreads rapidly through the crowd. Did she fall or was she pushed? At first it looks like an accident caused by overcrowding…until they lift the body and see the knife. Ex-SAS man, Andy Brewster, invalided home from a spell in Baghdad, works undercover for the Metropolitan police with his bomb expert partner, Burgess. 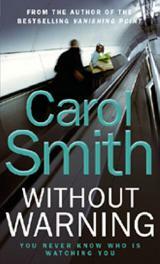 A second murder follows within days, another woman simply waiting for a train. Both had contented private lives; both were last seen talking on their phones. The CCTV cameras fail to pick up; the crowd was too dense at the time. When the July 7th bombs go off, the terrorist fear accelerates. Beth Hardy, no longer a caterer but now running a gourmet food-shop; her daughter, Imogen, a dancer at the National; sad Celeste, with her terrible secret that stopped her career before it began; Aisha, from the Whitechapel Road, breaking away from the family traditions; Ellie, a tourist from Wisconsin marooned in London by her husband’s accident; and recently widowed out-of-towner, Margaret, are all regular travellers on the Circle Line and thus potential victims. In addition to the terrorism threat, Brewster and Burgess have a race against time to stop another vicious knife attack.